The change of the seasons is amazing. Each one brings unique and interesting elements to life. In winter, snow and pines, come to mind, so why not learn two different candle making techniques to celebrate the winter season – a whipped “snow” effect and dipped pine cone fire starters. These candles are great for decorating in winter and make wonderful holiday gifts. And the best part is they are easy to make. Dipped pine cones are by far one of the easiest projects in candle making. In fact it is a craft you can do with kids old enough to cook, under your close supervision, of course. 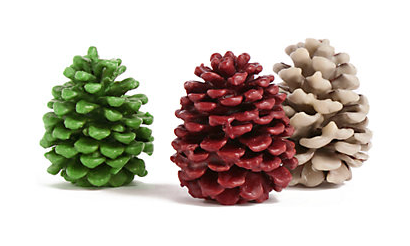 Scented and dipped in beautiful colors, these pine cones become extra special, as well as useful. Pine cone fire starters are used as kindling for a fireplace or outdoor fire. You light the wick that is attached to the pine. This will create a starting flame for about 10 minutes while the logs catch fire. This makes lighting the fire easy, and it lets off the candle fragrance into the room while it burns. Plus, they look beautiful stored in a basket near the fireplace. This recipe makes green, red and white holiday fire starters, but you can certainly change colors or scents. Prep your work area, laying down newspapers to protect surfaces. Then prep your pine cones. Tie the braided wick to the bottom of the pine cone and continue to wrap the wick around the pine cone several times working your way up to the top of the cone. Tie the wick to the top of the cone and leave enough wick to hold for dipping purposes. Continue to prep all of the pine cones. Melt desired amount of wax in the double boiler to 180-190 degrees keeping in mind that it should be enough to adequately dip pine cones (1 lb is a good starting point.) Add desired fragrance and dye. Remember, a little goes a long way. Once wax has melted, remove wax from heat. The easiest step to do next is pour the melted wax into a dipping can or deep metal container. If your double boiler is deep enough, you can just keep the wax in the pot. Next, holding the long wick of a pine cone, carefully dip your cone into the melted wax. You will notice that the first time doesn’t leave much color and the cone can be seen through the layer of wax. This is a primer. Place the cone on an old pan to cool or another non-stick surface. As soon as the wax begins to solidify, the pine cone can be dipped a second time into the melted wax. This time, you should see the colored wax on the cone. You can repeat this process until you’re happy with the results. Allow the pine cone to thoroughly cool. Then trim the wick to about 1-2 inches from the cone. Once you have one color and fragrance completed, you can make others. Then you can place them in baskets with a pretty bow to create an attractive set to store by the fireplace. To use, simply light the wick and carefully place on the logs in the fireplace. The wax will melt, filling the room with fragrance, and the pine cone will ignite and burn, which will catch the logs on fire. Alternative: If you don’t have a fireplace, you can still make and use these dipped pine cones as scented ornaments. Instead of wrapping a wick around the pine cone, tie it (or string) just at the top of the cone. Follow the remaining directions above. When the pine cone is dry, remove the wick or string and replace it with decorative ribbon. It will add color and scent to wherever you choose to hang it. Whipped candles go in and out of fashion. You might have seen them in the past as frosting on a “cake” candle or froth on a gel “beer” candle. The whipping technique is the same, so I if this is your first tutorial on whipped candles and you would like to try your hand at dessert or frosty beverage candles, you will follow the same instructions provided for snowy candles. In this example, we are making a snow effect, which can be used on round candles like a snow ball or in little pots as table centerpieces or party favors. Prep your work area, laying down newspapers to protect surfaces. Melt desired amount of wax in the double boiler to 180-190 degrees. One pound is a good starting point if you are only making a few candles, but the Vybar is 1 teaspoon for every pound of wax. Vybar is used to make the wax pure white. Add fragrance, if desired. Once wax has melted, remove wax from heat. Pour the melted wax into a dipping can or deep metal container. If your double boiler is deep enough, you can just keep the wax in the pot. Allow the wax to cool just to the point that it congeals on the sides of the pot and a thin film forms across the top. Now using a mixer or wire whisk, whip the wax until it is thick and foamy. Once it looks like whipped cream, you are ready to apply it to the candles. If making a snowball, holding the candle by the wick, dip it in the whipped wax. Then set it on the pan and allow it to cool for a minute. Once the wax seems to have set, using a spatula, paintbrush or wooden spoon, dab dollops of foamy wax on the bottom half of the round candle, so it looks like snow. Keep your spoon or brush in the wax when you are not using it so the wax doesn’t dry while you are working. Set the candle upside down and allow the candle wax to set. Then repeat this process for the top half of the candle until it looks like a snowball. Allow the candle to cool completely and trim the wick, if necessary. If you are making whipped snow in a container, you simply dab whipped wax on the top surface of the candle. If the whipped wax won’t adhere try running a hair dryer on the surface of the container candle to soften the wax a little. Then dab on the foamy wax until it looks like a pot of snow. Allow to cool and trim wick, if necessary. If you want to add that extra something, you can sprinkle a little iridescent glitter on the foamy wax while it cools.